In this work package, basis for a prediction tool applied for wood constructions will be developed. To this end, a “first level tool” based on combining complex methods and theory will be proposed. Then simplifications based on the important parameters identification will be suggested (link to WP 2). This methodology would be applied for both levels of prediction: the components (floors and walls) acoustic performance and the building acoustic performance (including direct and flanking sound transmissions). once the different possible prediction methods are identified, an iterative process will be carried out on predefined floors and walls (WP 2 and 3); their comparison will be based on assumptions, computing time, input data and differences between predicted and measured performance. The differences in weight, stiffness and density for wooden structures compared to traditional, heavy and more homogeneous structural material have repercussions on how the sound propagates throughout the structures, affecting the sound and vibration insulation performance. Lightweight structures are also more sensitive to dynamic loads. Therefore, knowledge about their dynamic behaviour is of crucial importance. Finite element simulations have proved to be useful in the design phase in a certain low and very frequency range. By further developing reliable finite element tools for low frequencies, the performance of future constructions could be predicted also in the low frequency range, saving both time and money as all calculations and modifications can be done during the design phase. The upper limit for using FEM has to be investigated further and merged with statistical methods. In the medium and high frequencies, the acoustic performance of wooden building components (walls and floors) is usually limited by the presence of structural links and couplings, called flanking transmission. Statistical Energy Analysis (SEA) has proved to be an efficient approach, providing robust vibroacoustic models in this frequency region [20–25]. SEA theory is used as the framework of EN 12354 . 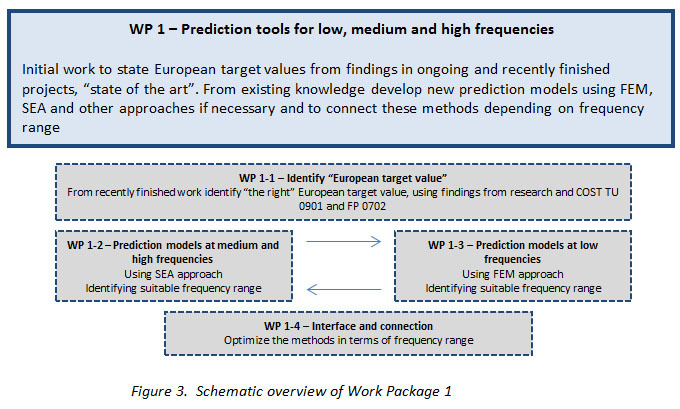 In this project SEA will be used to identify the vibrational energy transmission path and to propose solutions to WP3 and guidelines for improved mid and high frequency acoustic performance. The extension of this method towards the low frequencies will be investigated, especially regarding time responses of impact noise on floor systems, helpful for subjective evaluation of floors performance. A progressive procedure exists and work is already ongoing by FCBA on smaller wooden structures. For full-scale building, Virtual SEA method will be used which is developed by the project partner InterAC . In addition the SEA approach will be extended to low frequencies and an optimum overlap to FEM will be found. Villot M.; Guigou-Carter C. Predicting sound insulation in wood frame buildings. Proceedings of Inter-noise 2009. Guigou-Carter C.; Villot M.; Wetta R. Comparison of measured and predicted sound insulation in wood frame lightweight buildings. Proceedings of Inter-noise 2010. Guigou-Carter C.; Villot M. Prediction method adapted to wood frame lightweight constructions, Journal of Buildings Acoustics 13(3) (2006) 173-188.